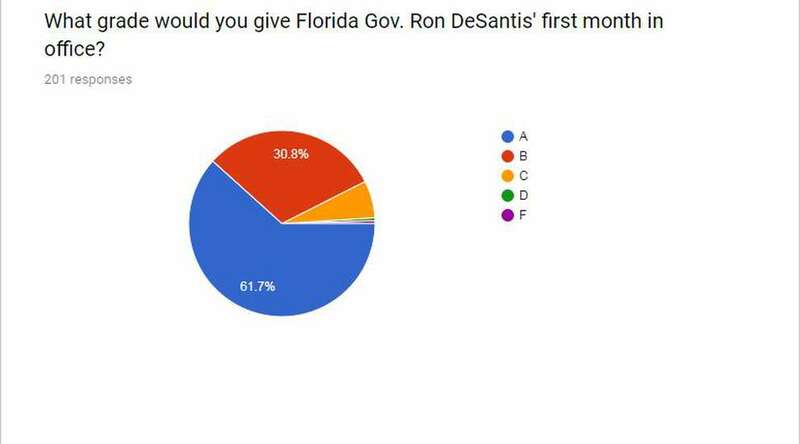 Florida Insider Poll: What Grade did Ron DeSantis earn in his first month as governor? And what about Rick Scott? Florida’s political class gives new Gov. Ron DeSantis high marks for his first 30 days in office. 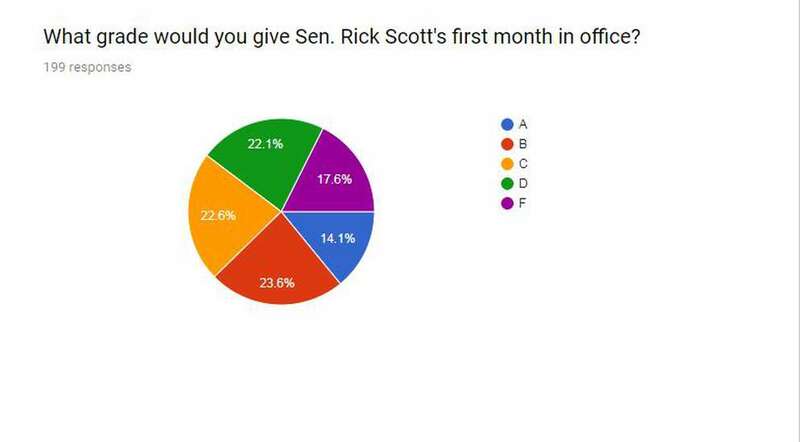 Nine out of 10 of the campaign operatives, lobbyists, money-raisers, political scientists and other veterans of Florida politics graded the Republican’s fast start as a B or better. Still, others cautioned there are more difficult days ahead, especially when the more conservative factions of his party in the House and Senate begin to scrutinize his budget. “He will be tested when it’s time to veto member projects and fight for affordable housing money,” said one Democrat. A Republican said: "He has set the bar very high. Can he sustain it? Vital is how he establishes his turf vs. the House and Senate. Is he more a cheerleader for particular bills, or does he lobby on their behalf. His Governorship has already been unique and original but does he assume a new role during the legislative session? " Meanwhile, Scott’s first month received much less love from our insiders. 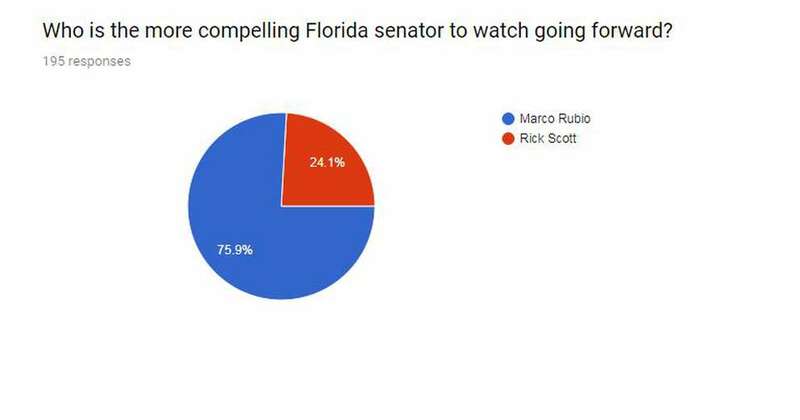 Results were decidedly split from A to F.
Speaking of Rubio, while he must now share the spotlight in D.C. with a fellow Republican, Florida Insiders still see the younger and nationally recognized Rubio as the more compelling political figure. Perhaps we should have asked if who is the more compelling Florida Republican going forward. Many of the Insiders saw the struggle for supremacy in the GOP between DeSantis, Scott and Rubio as a major storyline to watch this year. The answer: Donald Trump’s. The Insiders expect the president to spend a lot of time in this battleground in 2019 while the Democrats are forced to spend time in early primary states. 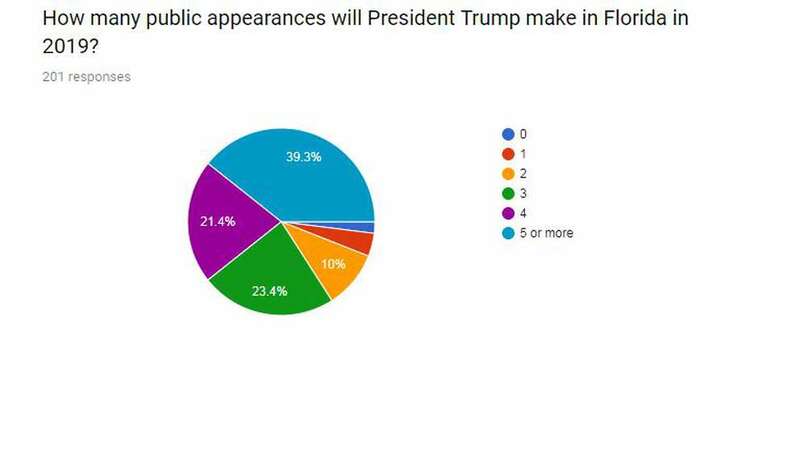 More than half the Insiders said Trump will be in Florida four or more times over the next 11 months. More poll results coming tomorrow. Joseph Abruzzo , Erin Aebel, Tom Alte, Jason Altmire, Gayle Andrews, Scott Arceneaux, Donna Arduin, Dave Aronberg, Brad Ashwell, Rick Asnani, Jon M. Ausman, Tim Baker, Ryan Banfill, Scott Barnhart, Rodney Barreto, Alan Becker, Geoffrey Becker, Samuel Bell, Ron Bilbao, Barney Bishop, Greg Blair, Katie Bohnett, Rick Boylan, Matt Bryan, Bob Buckhorn, Alex Burgos, Dominic M. Calabro, Kristy Campbell, Dean Cannon, Tim Canova, Al Cardenas, Reggie Cardozo, Chip Case, Kevin Cate, Chris Cate, Mitch Ceasar, Jill Chamberlin, Jim Cherry, Alan Clendenin, Brad Coker, David Colburn, Mike Colodny, Gus Corbella , Mathew Corrigan, Jon Costello, Brian Crowley, Ana Cruz, Husein Cumber, Richard DeNapoli, Lourdes Diaz, Pablo Diaz, Victor DiMaio, Tony DiMatteo, Michael Dobson, Doc Dockery, Paula Dockery, Brett Doster, John Dowless, Bob Doyle, Ryan Duffy, Barry Edwards, Eric Eikenberg, Mike Fasano, Peter Feaman, Mark Ferrulo, Damien Filer, Marty Fiorentino, Mark Foley, Kirk Fordham, Brian Franklin, Towson Fraser, Ellen Freidin, John French, Jack Furnari, Tom Gaitens, Josh Geise, Richard Gentry, Brian Goff, Alma Gonzalez, Ron Greenstein, Thomas Grigsby, Joe Gruters, Mike Hamby, Marion Hammer, Abel Harding, James Harris, James Harris, Jack Hebert, Alex Heckler, Rich Heffley, Bill Helmich, Cynthia Henderson, Mike Hightower , Don Hinkle, Brian Hughes, Erin Isaac, Aubrey Jewett, David Johnson, Christina Johnson, Jeff Johnson , Stafford Jones, Ken Jones, Eric Jotkoff, Doug Kaplan, Fred Karlinsky, Fred Karlinsky, Joshua Karp, Henry Kelley, John Konkus, Chris Korge, Kartik Krishnaiyer, Bill Lee, Jackie Lee, Matt Lettelleir, Alan Levine, Jack Levine, Tom Lewis, Stephanie Lewis-McClung, Beth Leytham, Susan MacManus, Jose Mallea, Roly Marante, William March, Beth Matuga, Kim McDougal, Nancy McGowan, clarence mckee, Kathy Mears, David Mica, Jon Mills, Paul Mitchell, Pete Mitchell, Edward Miyagishima, Travis Moore, John Morgan, Lucy Morgan, Pat Neal, Maurizio Passariello, Alex Patton, Darryl Paulson, Anthony Pedicini, Jorge Pedraza, Juan Penalosa, Joe Perry, Sean Phillippi, Gretchen Picotte, Ron Pierce, JC Planas, Benjamin Pollara, Van Poole, David Rancourt, Susannah Randolph, Ryan Ray, Marc Reichelderfer, George Riley, Jim Rimes, Franco Ripple, Terrie Rizzo, Patrick Roberts, Monica Rodriguez , Jason Rosenberg , Jason Roth, Sarah Rumpf, Ron Sachs, April Salter, Tom Scarritt, Steve Schale , Tom Scherberger , April Schiff, Kathleen Shanahan, stephen shiver, Bud Shorstein, Alex Sink, Patrick Slevin, Susan Smith, Adam Smith, John Stemberger, Alan Stonecipher, Nancy Texeira , Phillip Thompson, Greg C. Truax, Frank Tsamoutales, Greg Turbeville, Jason Unger, Gregory Ungru, Steven Vancore, Nancy Watkins, Robert Watkins, Screven Watson, Kevin Watson, John Wehrung, Mike Williams, Jamie Wilson, Rick Wilson, Leslie Wimes, Jon Woodard, Jeff Wright, Mark Zubaly.